Forget for a minute about the invasive brown marmorated stink bug that has become such a common pest in homes, backyards, and farms in recent years. Cotton growers in the United States are also concerned about native stink bugs that have attacked cotton and other crops for decades. 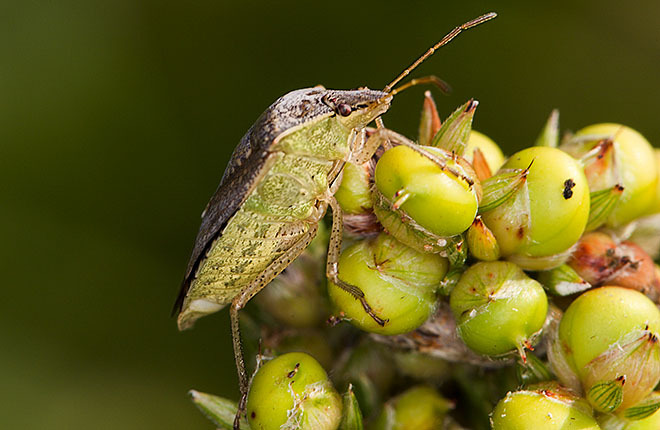 The green stink bug (Chinavia hilaris), southern green stink bug (Nezara viridula), and brown stink bug (Euschistus servus) continue to threaten cotton. But an Agricultural Research Service (ARS) scientist in Georgia has found some environmentally friendly alternatives to insecticides, and the practices are catching on with growers. "Cotton growers are increasingly interested in producing their crops in ways that have less impact on the environment," says ARS entomologist Patricia Glynn Tillman, who is based in Tifton, Georgia. The three native stink bugs are immune to the insect-killing toxins incorporated into most modern cotton varieties. Insecticides are effective, but they also kill the stink bug's natural enemies, and they often require repeated use throughout the growing season. Organic growers can't use conventional insecticides. Because of work by Tillman and others, some growers are planting "trap crops," such as soybean and grain sorghum, to lure stink bugs away from cotton. Other options include pheromone-baited traps, which capture and kill stink bugs, and nectar-producing plants, such as milkweed and buckwheat, to feed native parasitoid wasps that attack stink bugs. Results of the study appeared in the October 2015 issue of the Journal of Economic Entomology. — By Dennis O'Brien, ARS Office of Communications. "Protecting Cotton From Stink Bugs" was published in the July 2016 issue of AgResearch Magazine. In 2015, Georgia cotton growers spent $12 million to control stink bugs. ARS scientists found environmentally friendly controls. Control options include physical barriers, pheromone traps, trap crops, and nectar-producing plants.